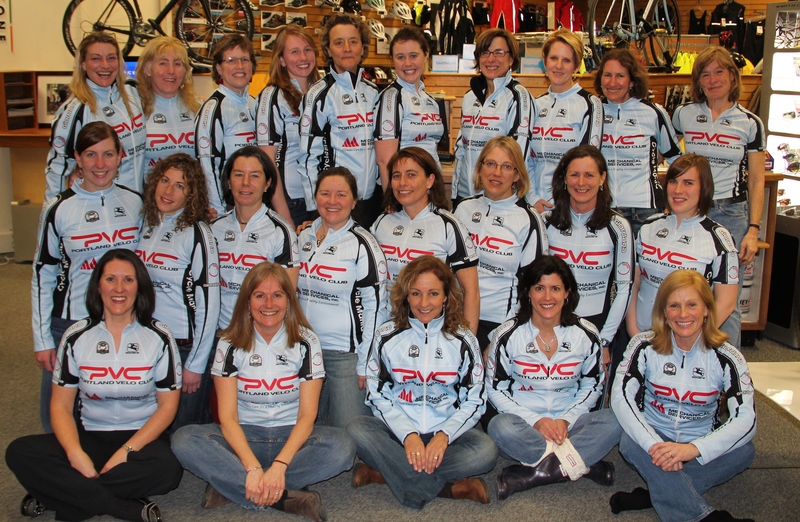 The kits for the PVC women arrived recently so we organized a kit distribution social as an excuse to get together. We had about 50% of our membership base participate, which made for a nice group photo. 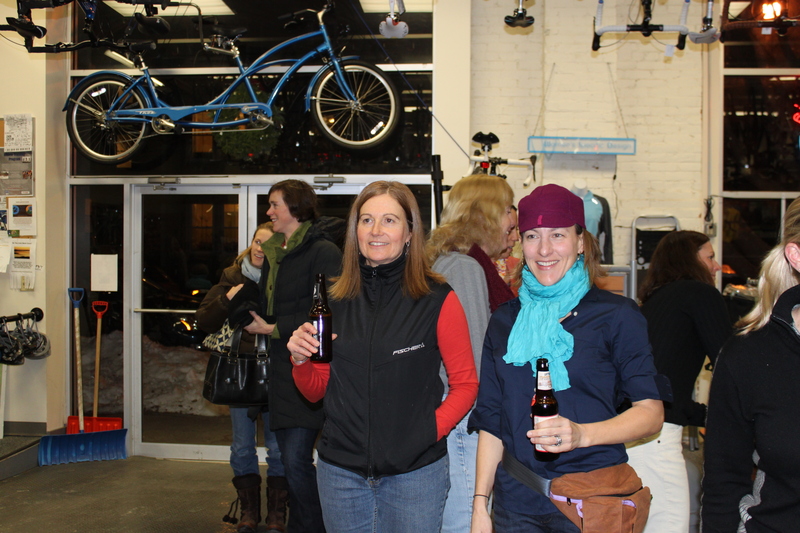 I’m not alone in my assessment that we have a wonderful group of women ranging from 25 to 60 who just love to get together to ride their bikes. (And if you thought the 25-year-old smokes the 60-year-old on two wheels, you’d be dead wrong!) Our group continues to grow and it’s a testament to the character of the women and cohesiveness of the group. The respect and support these women give each other is truly amazing. AND we have a ton of fun!! I own several cycling caps. I own almost as many cycling caps as Fatty owns back packs. I have a new wool Capo cap that has a section in the back that you can turn up in the back or pull down over the ears if it’s cold. Then I have two other cotton Capo caps – white and blue. I have an Embrocation cap, given to me by my friend, Chris LaFlamme. (I think technically it was for my husband but I confiscated it. Don’t tell him!) I also own two other basic caps that I purchased on Nashbar a few years ago, and rarely wear them. It’s rare to see women wearing cycling caps. I’m not sure why that is. I really started wearing them consistently this past year and love them. I won’t always wear them in the summer, they tend to be too warm, especially with all the hair I have. But during the remainder parts of the year I wear them as I’d wear a pair of cycling gloves – they just become part of the process. Cycling caps for me give me a little extra warmth when needed and are small enough to take off an slip in my jersey pocket. The brim is great for visibility when the sun is just right to blind you, and it also shields my face a bit when it’s raining. Recently, my friend Julie has started making wool cycling caps to sell. She has been displaying at a few craft shows – sadly I’ve been unable to attend them. After the end of the PVC Women’s training clinic she presented me with it, saying she made it especially for me since it was “my color” (a nice magenta color). You might have seen my twitter on this Thursday evening. There is a lot to be said for a simple gift you receive from a friend made just for you – they mean so much! So I couldn’t wait to wear my new cap on the bike, which I did Saturday. The cap was comfy, warm, with a perfect fit. But I must say it was the brim that impressed me the most. It was at just the right location and deep enough to shield the sun from my eyes. 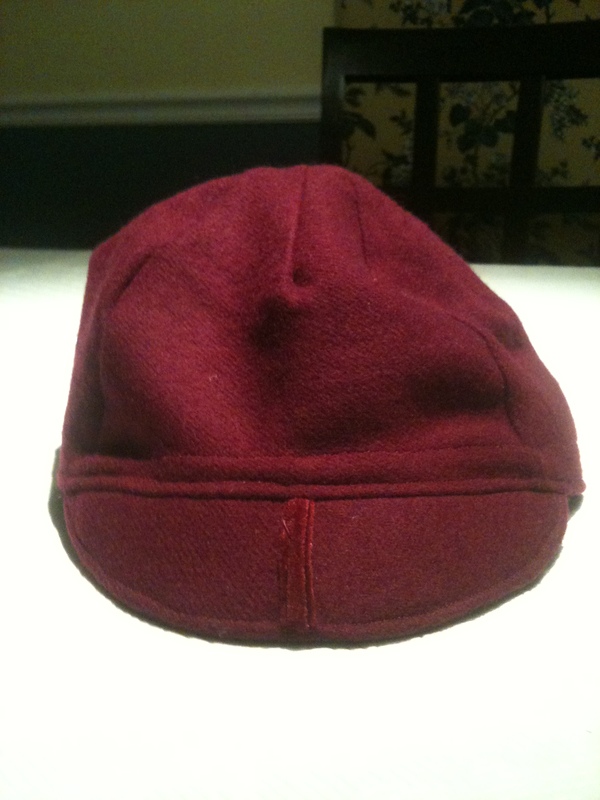 It was also a stiffer brim than what it offered on the new Capo wool cap. I have an idea I just found my new favorite cycling cap! I don’t ride much in the rain or in wet conditions. Sometimes I ride on wet roads but the use of boot covers do a nice job at keeping my feet dry. Wednesday was a different story. My teammate, Meg, is moving away and we had decided to have a “farewell ride” for her. Unfortunately the weather wasn’t very nice for riding but Meg wanted to ride rain or shine. And rain it did. So we went out for about 20+ miles. About 5 miles in my feet got wet. It was the soggy kind of wet where you think there is about an inch of water in your shoes. I had heard about a trick of putting newspapers in your shoes to absorb the water. It doesn’t sound like it would work well but I’m here to tell you it does! In preparation for the Friday morning coffee ride I went to check on my shoes and they were still soaking wet, even though I had taken out the insoles after the ride Wednesday night. So I stuffed them with crumpled up newspaper for the night and hoped for the best. 8 hours later I pulled out the newspaper and were shocked to see how dry they were. It really worked well. I never made it on the Friday morning coffee ride today. It was raining when I went to leave. One soggy ride this week was enough for me. I’ve had two consecutive days off the bike due to the rain and this might prove detrimental with the upcoming Time Trial on Sunday. Tomorrow should be a better day and I’ll have to get in a decent ride to work the kinks out of the legs prior to Sunday morning. Okay, I know that I have a fair bit of male readers here. I’m sure the subject line has tipped you off to the fact that this is a post for the ladies who read this blog. The subject, of course are sports bras. I have found some good deals on sports bras lately. They are a necessary piece of clothing for biking, or other sports. What I’m finding is that they are so comfortable that I have been wearing them in place of my other bras. Perhaps some of you don’t have this problem but many of my bra straps won’t stay on my shoulders, regardless of how much adjusting I do with the straps. So the easy solution is wearing more sports bras. They are undetectable under a suit or many of my blouses that are worn for the office. My sports bras are no longer just for sports! Some of you know how much I love Castelli cycling apparel. The most important person that knows this is my husband. 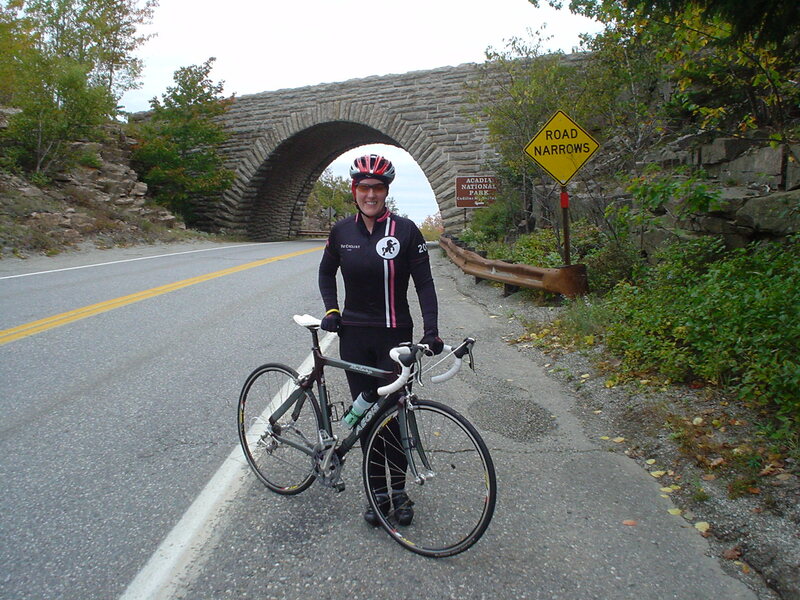 I love Castelli because they make good quality items and we can usually find deals on them. Another reason I love Castelli is that not everyone and his/her brother wears it. Pearl Izumi is ubiquitous in the cycling world, and although I like their products and own some, I much prefer Castelli because it’s much less common. Castelli also has some of the best designed clothing I’ve ever seen. I’ve also been pining for a pair of Sidi shoes. Who doesn’t?? Santa didn’t disappoint. My sister asked me on Christmas Eve if I’d be having a biking Christmas, wondering if I’d be receiving biking items this year. I told her that for the last few years, since I’ve been into cycling, that has been the case. My husband was within earshot and I want to assure him, and her, that even if it wasn’t a “biking Christmas” I wouldn’t be disappointed. I never am. Everyone should have a special Santa like mine! I only wish I could buy for him like he buys for me! I always fall a bit short, way short, of that benchmark. I didn’t mention everything here. I received more cycling and some non-cycling items that were greatly appreciated as well. There was also more to my Christmas than just presents, which I will explain in my next post. In the mean time, let me know what special gift, biking related or not, did you receive! Yes, I’ve finally returned from our Bar Harbor trip. Bear with me while I work on some fresh posts. We took some great photos and a little video. The weather was great and the scenery doesn’t get much better! I’m excited to get my posts up so stay tuned!